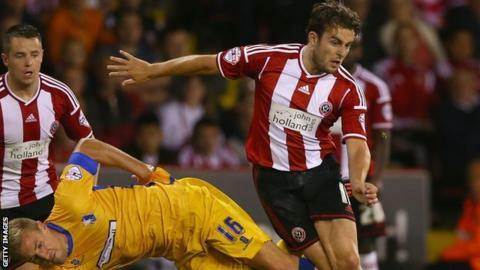 Preston North End remained unbeaten in League One after a pulsating draw against Sheffield United at Deepdale. Andy Little opened the scoring for the hosts when his curling cross found the far corner of Mark Howard's net. Jose Baxter levelled for the visitors with a deflected effort from just outside the box. Howard later kept out Jack King's header to keep the Blades level, while Michael Higdon's effort at the other end was cleared off the line. Jamal Campbell-Ryce, who was lively throughout, had a great chance to level when he raced onto a poor back pass, but his lobbed effort was straight at the keeper. Baxter's deflected effort brought the sides level, before Garner fired a 30-yard effort inches wide. The second half was played at a frantic tempo, but the two goalkeepers were in fine form. Howard made two stunning saves to keep out Jack King's point-blank effort and a Chris Humphrey curler, while Ben Davies' effort for the visitors was expertly tipped over by Jamie Jones. "There are fine margins in football matches. "Any supporter who's been at Deepdale today would have felt they've seen a fantastic game of football. There were chances scored and missed. "We'll probably feel more disappointed that we've not gone away with the three points given the opportunities we've had, especially in the second half." "It was a brilliant game throughout, chances at both ends. "I'm biased, but I thought we just edged it, especially in the first half. "The second half was open again, chances at both ends, we could have won it, and Mark Howard comes up with a couple of saves to preserve the point for us." Match ends, Preston North End 1, Sheffield United 1. Second Half ends, Preston North End 1, Sheffield United 1. Substitution, Sheffield United. Robert Harris replaces Michael Doyle. Foul by James Wallace (Sheffield United). Attempt missed. Marc McNulty (Sheffield United) header from the centre of the box is close, but misses to the right. Substitution, Sheffield United. James Wallace replaces Jose Baxter. Corner, Preston North End. Conceded by Jamal Campbell-Ryce. Substitution, Preston North End. Paul Gallagher replaces Andy Little. Corner, Preston North End. Conceded by Jose Baxter. Jamal Campbell-Ryce (Sheffield United) is shown the yellow card. Scott Wiseman (Preston North End) wins a free kick on the left wing. Corner, Preston North End. Conceded by Mark Howard. Attempt saved. Jordan Hugill (Preston North End) right footed shot from the centre of the box is saved in the centre of the goal. (Sheffield United) wins a free kick in the attacking half. Corner, Sheffield United. Conceded by Jack King. Attempt saved. Jordan Hugill (Preston North End) header from the centre of the box is saved in the centre of the goal. Corner, Preston North End. Conceded by Ben Davies. Foul by Harrison McGahey (Sheffield United). Jordan Hugill (Preston North End) wins a free kick in the attacking half. Attempt blocked. Alan Browne (Preston North End) right footed shot from outside the box is blocked. Substitution, Preston North End. Jordan Hugill replaces Josh Brownhill. Attempt blocked. Michael Higdon (Sheffield United) header from the centre of the box is blocked. Attempt missed. Joe Garner (Preston North End) header from the centre of the box is just a bit too high.